For thousands of years, killer whales have hunted the great baleen whales in every ocean on earth, yet only in one place have they ever co-operated with humans to hunt whales, and then largely only with one family, the Davidsons. 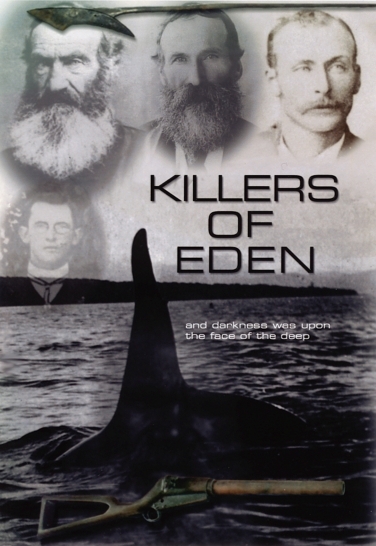 “Killers of Eden” is the extraordinary story of the contract between man and one of nature’s most powerful and intelligent creatures. Each year for more than a century on Australia’s far south east coast, autumn moved into winter and the killer whales would return to Eden from the Antarctic and lie in wait. Their prey were the baleen whales journeying to and from their breeding grounds hundreds of kilometers up the coast. Three generations of the Davidson family worked with the killer whales, often invited by the killers and led out to sea to join in the hunts. A few members of the pod of orcas would swim right into the mouth of the kiah river where the Davidsons had their two isolated houses on the opposite side of the bay from the township of Eden. They would then breach or thrash their tails on the water surface untill the whalers emerged and rowed their boats out to meet them. The Davidsons called this behaviour “flop-tailing”. No other Eden whalers were ever visited in this manner. On cloudy moonless nights, the Davidson crews would follow the glowing bioluminescent trails of the orcas which would light up the sea. Συνεντεύξεις με τους κατοίκους μάρτυρες των γεγονότων εδώ.